What are the Best Dermal Fillers For Marionette Lines? What is a marionette line? A marionette line—also known as oral commissure line—is the long, vertical facial wrinkle that extends from the corners of the mouth to the chin. Patients with severe cases of this aesthetic imperfection may be presented with deep-set marionette lines that laterally circumscribe the chin, often resembling a marionette doll; hence, the name. Marionette line usually sets in due to ageing. The biological ageing process causes the skin to lose its thickness, elasticity, and volume, often resulting in the downward shifting of the skin and eventual formation of wrinkles in areas of high movement. If left untreated, marionette lines not only make a person look older that the chronological age, they also give an inaccurate perception of one’s emotional cues. While dynamic lines like forehead lines and crow’s feet that appear on the upper half of the face respond well to botulinum toxin injections, marionette lines are best treated with dermal fillers. A good example of dermal filler brand is Belotero Intense. This is a type of non-animal hyaluronic acid-based filler that is manufactured by Merz Pharmaceuticals. The filler is processed to contain a perfect balance of plasticity, cohesivity, and elasticity using patented Cohesive Polydensified Matrix (CPM) and Dynamic Cross-Linking Technology (DCLT). Another equally effective hyaluronic acid soft tissue implant is Juvederm Vollure XC, a product of Allergan. The hyaluronic acid molecules are also sourced via biofermentation before being cross-linked using proprietary Vycross Technology, resulting in smooth injectable gel with majority (90%) of high molecular weight and minority (10%) of low molecular weight of hyaluronic acid particles. Both of these fillers are integrated with fast-acting lidocaine, although Belotero fillers are also available without lidocaine, to reduce pain and discomfort during the procedure. Once administered into the marionette lines via intradermal injections, the implants will instantly plump, lift, and reinforce drooping skin, and soften the appearance of commissure lines. 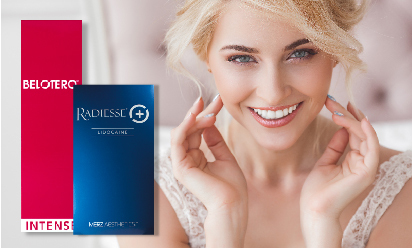 Besides hyaluronic acid type fillers, patients with marionette lines can also opt for Radiesse, a biostimulating implant that is composed of calcium hydroxylapatite (CaHA) microparticles suspended in a smooth aqueous gel carrier. Once administered into the wrinkle, the gel carrier instantly lifts the marionette while the CaHA microspheres encourage fibroblasts to regenerate more collagen fibres via neocollagenesis, leaving behind elastic and firmer skin. You can discuss your patients expectations, preferred treatment, and budget to determine the best filler for them.